Welsh bass baritone Bryn Terfel won the prizes for best album and male artist at this year's Classical Brit awards. 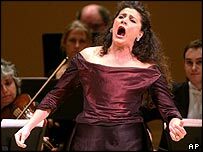 Italian opera star Cecilia Bartoli was named best female artist at the event, held at London's Royal Albert Hall. British conductor Sir Simon Rattle won orchestral album of the year for his recording of Beethoven's Symphonies with the Vienna Philharmonic. The awards, in their fifth year, are billed as the orchestral and operatic answer to the pop and rock Brits. Terfel won the best album award - the night's biggest prize - for Bryn, which has sold more than 300,000copies in the UK since it was released last year. Mezzo soprano Bartoli beat New Zealand-born teenager Hayley Westenra to win her award, while Terfel triumphed over violinist Nigel Kennedy in the male category. Another violinist, 29-year-old Daniel Hope, was named best young British classical performer. The contemporary music award went to US composer Philip Glass for his soundtrack to the film The Hours. Russia's Maxim Vengerov won the critics' award for his recording of Benjamin Britten's Violin Concerto and William Walton's Viola Concerto, conducted by his friend and mentor Mstislav Rostropovich. Guests at the ceremony - hosted by ITV news presenter Katie Derham for the fourth year running - included former boy soprano Aled Jones, actor Nigel Havers and musical star Elaine Paige. The event, which will be broadcast on ITV1 on Sunday, featured performances from Westenra, Kennedy, fellow violinist Vanessa-Mae and Welsh soprano Katherine Jenkins. American soprano Renne Fleming, the recipient of this year's outstanding contribution to music award, joined Terfel for a duet of Bess, You is My Woman Now from the musical Porgy and Bess. There were also performances from Amici Forever, the world's first "opera band", and the King's College Choir Cambridge. Five awards were decided by the Classical Brit awards' voting academy, a body made up of media professionals, members of the Musicians' Union, promoters, industry executives and orchestra leaders. The album of the year award was decided by Classic FM listeners.